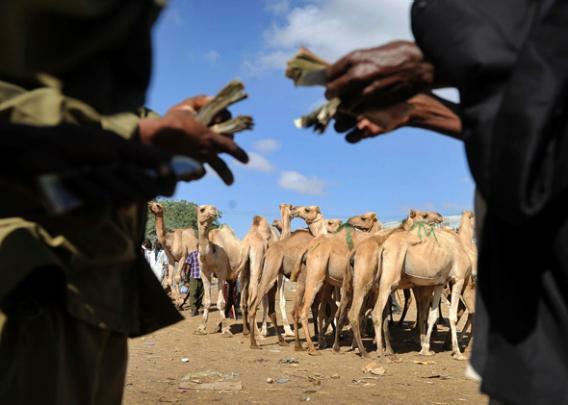 Somaliland’s camel market: Could camel meat be this unrecognized nation’s path to riches? The struggling nation of Somaliland is betting these beasts of burden will be on the menu far and wide. HARGEISA, Somaliland—From early in the morning until midday, the streets of southern Hargeisa, Somaliland periodically shut down as hundreds of camels trundle along the narrow city streets. Taxi drivers give way, milling on the side of the road, wiping their cars clean of the dust and mud kicked up by the procession. Ultimately, the beasts file through the gates of the Hargeisa Camel Market. No one really runs the market. It’s just one of dozens of sites across the country where nomads, locals, and traders converge daily to buy and sell thousands of live animals, some for the neighborhood butcher’s block, others for export. And to most folks in Hargeisa, it’s just a fact of life—a reflection that, despite the boom in the city’s population and the development of modern, multistory office buildings, Somaliland is still a largely pastoral economy. But downtown, in the knot of government offices near the presidential palace, the ministers are eyeing this market with new ambitions. They have analyzed the country’s resources, crunched the numbers, and decided that these nomads may offer the safest and quickest passage for taking this fragile economy from relative poverty to a more thorough modernity. Actually, it’s not as if Somaliland has many options. A self-declared but officially unrecognized nation, Somaliland is a little smaller than Idaho, with twice the population, but less than 5 percent of the annual budget. The de facto nation is rich in natural resources beyond livestock, but its infrastructure—potholed roads and no central electrical grid or water system to speak of—can’t get the goods to market. If that doesn’t deter intrepid investors, the place’s legacy of violence and piracy probably does. The country may lack roads, cash, and skilled workers, but it does have one important source of manpower: nomads. It’s hard to say how many there are, as there’s been no census since the civil war in the early 1990s, but some estimate that up to 70 percent of Somaliland’s population is nomadic. The nomads have created trade routes and depots across terrain that cars can’t easily navigate, but camels can. The Hargeisa Camel Market is just one point in a nation-wide network of markets. Wandering among the flocks dotted across the sale grounds, I see a line of rams, roped together neck-to-neck, purchased at roughly $80 a head. (Camels can sell for anywhere from $300 to $1,000 per head, depending on their size.) An agent, a robust man in a cowboy hat who’s been culling the choicest animals from the nomads’ small herds for butchery or export, will come by later to haul them away. But before the agent leaves, he must pass a dozy government official sitting by the gate. He will pay around $1 in tax per sheep or goat, and up to $5 per camel. If he takes the animals to the port of Berbera for export, he’ll pay another tax as well. It’s a minuscule fee compared to what he paid for the animals—and the profits he stands to make as the middle-man—but for a small government strapped for cash, it’s a good chunk of income. And the government, after running the numbers for its new National Development Plan, believes the nomads could become a much larger, more lucrative market. The export markets Hassan has in mind are the Persian Gulf cities like Dubai, Doha, and Abu Dhabi. But the potential for livestock goes beyond acting as the Red Sea’s Texas ranchland. There’s a growing, universal market for camels, the favored herd animal of Somaliland’s nomads. 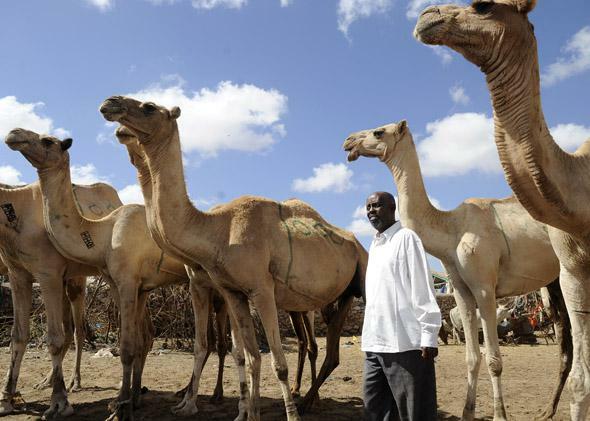 Somalia houses more than 6 million camels, the largest population in the world. (Somalis have some 46 words for camels; nomads have composed and handed down hundreds of poems that extol the animal’s role in Somali culture.) Mainly beasts of burden, vehicles for war, and sources of milk, they also served until very recently as the only acceptable unit of payment for blood money in clan disputes. Yet Somalis typically do not raise more camels (or other livestock) than they need. The size of herds has rarely exceeded demand. Where camels are concerned, it’s typically only been local demand that mattered. But, in recent years, the world has started to buy camels for their flesh rather than just their labor. Part of the growing market for camels is novelty. Although every neighborhood here has at least one café that serves up camel dishes, it is rarely eaten outside of Somaliland and is still considered a delicacy in other camel-rearing countries—reserved more for parties and special events than daily consumption. But it’s not just the sheer numbers of this luxury livestock in Somaliland that offers so much economic upside; perhaps camel’s greatest appeal lies in its health properties. Workers milk a camel on the outskirts of Somalia’s capital Mogadishu. The United Nations Food and Agriculture Organization asserts that the global camel milk market may be worth $10 billion. There’s truth to this local wives’ tale. Camel is high in protein but often less than half as fatty as beef. On the vitamin rundown, it’s particularly rich in vitamin E, while its milk has up to three times more vitamin C and 10 times more iron—and significantly less lactose—than cow’s milk. And word is getting out. Meramist, a camel-rearing company in Queensland, Australia, had to increase its production by 20 percent in 2012, reacting to a spike in demand from European, American, and Japanese consumers. Somaliland would be well positioned to break into that market, if they solve a few lingering problems, chief among them how to prove to prospective buyers that they can make it taste good. My camel-eating experience has been inconsistent, to put it gently. My first dish of boiled neck meat was tender and rich enough to pick off the bone by hand. The second and third times I ate camel neck, though, the meat was tough and flavorless. So I asked Dababo, the cook, to explain just how Somalis prepare camel. She invited me to watch. Every morning, Dababo and her girls buy a camel from the local butcher. They prefer young and tender flesh (although still leaner and stringier than beef), but sometimes what they’re given is old and tough—and camels get exceptionally tough as they age. Regardless of the age, the recipe stays the same: Chop it up, throw it into a pot of boiling water over a metal drum filled with hot coals, and boil for 90 minutes with tomato, cabbage, onion, potato, salt, and pepper. In the last 15 minutes, she adds strips of the spongy, greasy hump to the pot—no, the hump isn’t filled with water, it’s mostly fat—and then dishes both out, unadorned, on a plate. Of course, there are ways to make camel meat tender. Professor Isam Kadim of Oman’s Sultan Qaboos University has built a career studying and developing techniques for tenderizing camel meat. But these methods involve butchering and processing the meat, which due to the country’s purely live-animal trade, Somaliland doesn’t have the infrastructure in place to handle. Thus the government’s big plan: Make it possible for nomads—someday, even commercial ranchers—to keep larger herds and sell more meat at higher prices. The government’s developed one slaughterhouse in the city of Burco and instituted vaccination programs to keep herds healthy. It hopes to install slaughterhouses and cold storage units across the nation. Rendering the meat and selling it pre-packaged and cold, Shire suspects, could nearly double the gross revenue and open the nation to wider markets. If camels take off, and each camel yields between 550 and 1,400 pounds of meat, that’s a massive profit for nomad and government alike. And officials plan to use the whole camel. They are also seeking, with the United Nations’ help, to train nomads in dairy production; the United Nations Food and Agriculture Organization asserts that the global camel milk market may be worth $10 billion. Add their training programs in artisanal craftwork using camels’ bones, and they will have monetized almost every aspect of these desert creatures. From afar, it seems like a lot to expect of nomads. Driving along the dried up riverbeds that serve as roads in the north of the country, though, you’re likely to get stuck behind a meandering train of wild camels. Sometimes the line of beasts seems to stretch forever. This is one resource the country has in droves, alongside a ready and able workforce. The markets are in place, the world is hungry; Somaliland’s future prosperity may just ride on the camel.